A complete different approach. GHAHC is FEAR FREE Certified clinic. 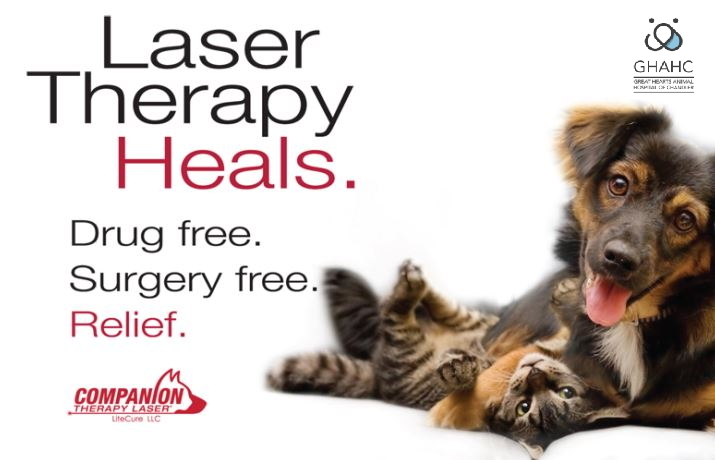 Great Hearts Animal Hospital of Chandler now offers the Laser Therapy which accelerates the body’s natural healing process through photo-bio-modulation. It is the most advanced technology that is an FDA-cleared modality that reduces inflammation and that results in pain reduction. Laser Therapy is effective in treating acute pain, chronic conditions, and post-operative pain. Drug Free. Surgery Free. Relief for your pet. Therapy Lasers have been scientifically proven and successful in treating post-surgical pain and many acute and chronic conditions. Laser therapy treatment is safe, painless and fast. Treatments to deeper tissues are administered in 5 to 10 minutes. Typically, even chronic patients exhibit improvement after 3 to 5 treatment sessions. Laser therapy utilizes the body’s own healing powers by stimulating cellular activity. Despite short treatment times, laser therapy treatments initiate a healing process that continues to actively reduce inflammation for up to 24 hours after treatment. Our team wants to ensure you have the information you need to make the right decisions for your pet’s health. With our advanced tools, we can help make that possible. Great Hearts Animal Hospital of Chandler is committed to providing the highest quality diagnostic and right treat for your companion. If you have any questions or concerns, please don’t hesitate to contact us at 480-895-3223.